The recent surveys that I’ve seen don’t sort respondents on whether they know that the allegations have or have not been corroborated. Too bad, that would tell us a lot. 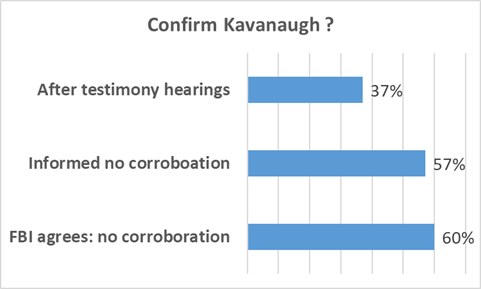 How informed are the people opposing Kavanaugh? One indicator might be: How many people got firsthand knowledge by actually watching the hearings? Channeling Nielsen data, Forbes summary reports:. On the three major news networks, Fox News, MSNBC and CNN, the hearing averaged 11 million total viewers from 10 a.m. to 6:45 p.m.
Viewership peaked from 3:15 and 6:45 p.m., when Kavanaugh himself testified, with almost 13 million total viewers. Fox drew about ½ of the cable audience; CNN and MSNBC equally split the other half. 11 million is less than 10% of the number of people who voted in the 2016 election … and, the 13 million peak gets edged out by the number of people who watched this year’s America’s Got Talent finals. OK, you say: People were working and couldn’t watch the daytime hearings … but, they got informed by the recap shows. In primetime, when the cable news networks rehashed what had happened, Fox News led with 5.5 million total viewers, followed by MSNBC at 3.2 million. CNN drew 1.9 million viewers. That totals about 11 million. It’s unclear how many of the 11 million were unique viewers … and how many overlapped with the daytime audience. For the sake of argument let’s assume that there’s no overlap between the daytime and prime time viewership. That would give us a gross total of 22 million … about 1 in 5 of people who voted in 2016. Said differently, 80% didn’t watch any TV coverage. Still, they feel comfortable forming (strong) opinions … most likely from their politically aligned cable shows and blogs … and from the mainstream media. How many people know, today, that Dr. Ford’s charges couldn’t be corroborated … even by her longtime friend who was supposedly at the “gathering”. And, how would the uninformed feel if they were informed? P.S. My bet: the hearing’s viewership dwarfed the number who watched Sen. Collins speech. That doesn’t stop the uninformed from putting Sen. Collins in their crosshairs. Collins walks thru all of the objections to Kavanaugh’s legal opinions … and the gaping holes in Dr. Ford’s accusations. This entry was posted on October 10, 2018 at 6:59 am and is filed under Kavanaugh, Brett, SCOTUS. You can follow any responses to this entry through the RSS 2.0 feed. You can leave a response, or trackback from your own site.